Calculate "M" (multiplier) or take from Table 2.
determine what the short circuit current will be at the transformer secondary. flow through the shorted secondary, the transformer impedance is 9.6/480 = .02 = 2%Z. high end worst case, multiply %Z by .9. For low end of worst case, multiply %Z by 1.1. Step 3. Determine by formula or Table 1 the transformer letthrough short-circuit current. See Notes 3 and 4.
to 6 are commonly accepted. the transformer primary is known. step 3 by .9 or .942 respectively. multiply the total motor current in amps by 4. Values of 4 to 6 are commonly accepted. Step 4. Calculate the "f" factor. L-N center tapped transformer terminals, IL-N = 1.5 x IL-L at Transformer Terminals. L = length (feet) of conductor to the fault. Table 5 of “C” values for busway. E = Voltage of circuit. *See note 4 on page 240. This example assumes no motor contribution. require a slightly different procedure than 3Ø faults on 3Ø systems. 1. It is necessary that the proper impedance be used to represent the primary system. formula by multiplying the single conductor or single-phase impedance by 1.73.
calculations by multiplying the 3Ø primary source impedance by two. half-winding (generally line-to-neutral) fault condition. winding is involved but, only the half-winding on the secondary is involved. • 1.5 times full winding %R on full winding basis. • 1.2 times full winding %X on full winding basis. 100 feet of cable impedance must be included in the calculation. and larger have a ± 10% impedance tolerance. 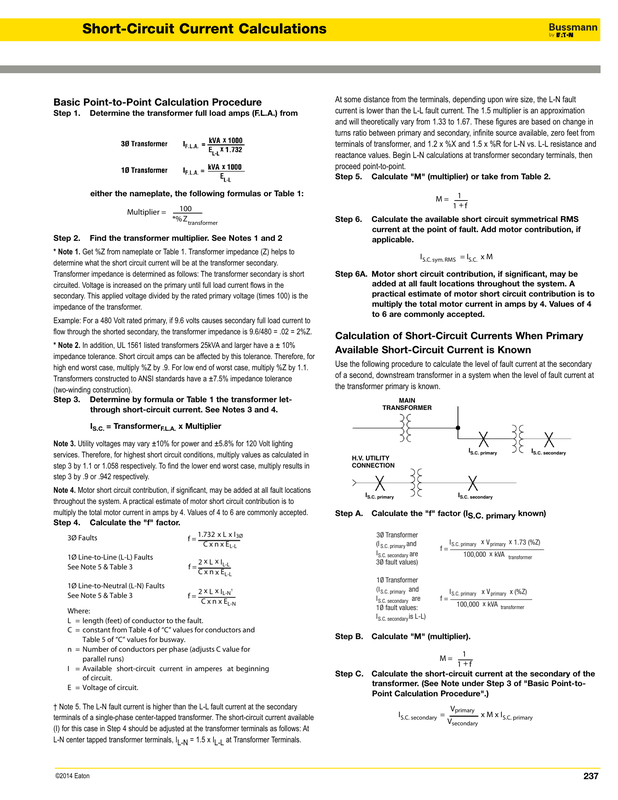 ** Three-phase short-circuit currents based on “infinite” primary. † Fluctuations in system voltage will affect the available short-circuit current. manufacturer for values to use in calculation. available short-circuit currents than as shown in Table 1.
and 14-8 AWG at 15 kV are not available and values for 3 AWG have been approximated). impedance in a survey of industry. full-load current, ambient temperature, number in a raceway, etc. the number of conductors per phase. conduit–3 phase, 40 amp load at 80% power factor. (For a 240V circuit the % voltage drop is 5.364 x 100 or 2.23%). well as resistance of the wire. of wire indicated has sufficient ampacity. amps), by one over the number of conductors per phase. Divide that figure into the permissible volt loss multiplied by 1,000,000. 180 x 40 x = 7200. 5.5 x 1,000,000 = 764.
divide single phase value by 2.
temperature because the resistance increases. based upon a 40ºC ambient, see Table 310.15(B)(2)(b). † Figures are L-L for both single-phase and three-phase. Three-phase figures are average for the three-phase. allow one amp to flow under a pressure of one volt. – it takes a “short cut” around the load and back to the source. exceeded. Overcurrents take on two separate characteristics – overloads and shortcircuits. conductors, through the load, back through the conductors, to the source again. operates in its current-limiting range. opened, and then reused. Renewable fuses are made to Class H standards. An electrical load which is characteristic of not having any significant inrush current. without first rising to a higher value. the resistance as the periodic current does. occurrence of excessive damage when protected with an overcurrent protective device. taken, causes overheating and failure. without opening, but is so designed to open on sustained overloads and short-circuits. specified period of time without the occurrence of extensive damage. I ≈ E ≈ % eff.